« When knowledge becomes Ignorance . . . science is set to grow fast ! A 55 year old man came with a BP of 1o0/70 with vague symptoms of back pain to our ER. Just observed in CCU with heparin infusion , Aspirin and clopidogrel . Serial ECGs were taken . And now . . . after 24 hours a new complete heart block appear with classical evolved pattern of inferior MI.The most interesting feature is patient has been comfortable all along even as his posterior aspect of heart is experiencing terrible electrical earth quakes. Is troponin Guided thrombolyis an accepted concept ? 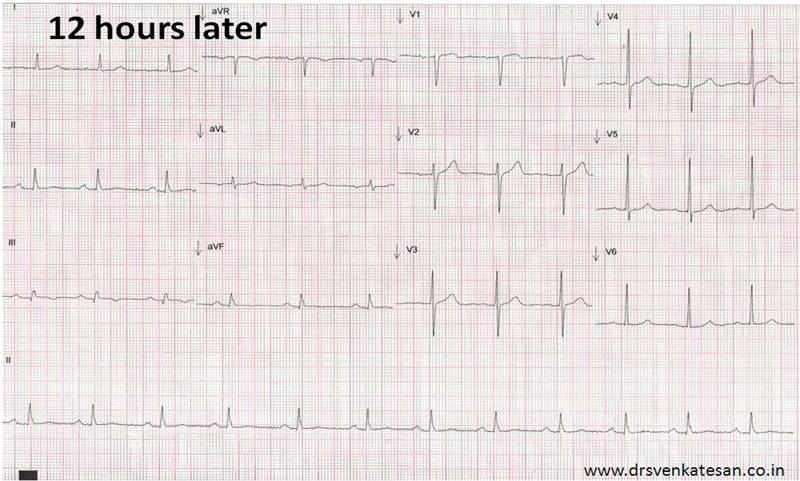 Yes , only in few situations like , posterior MI , LBBB , pacemaker rhythm, re infarction . (Note , true posterior MI do not elevate the ST segment but depress it ) . The benefits of thrombolysis is not proven in small and micro infarcts. ECG ST eelvation remain the sole criteria for thromolysis for STEMI because of high degree of correlation with total coronary occlusion . OK , what happened to this patient ? Temporary pacer was kept stand by with a sheath and catheter in situ. Next day morning AV block disappeared .Patient was comfortable . 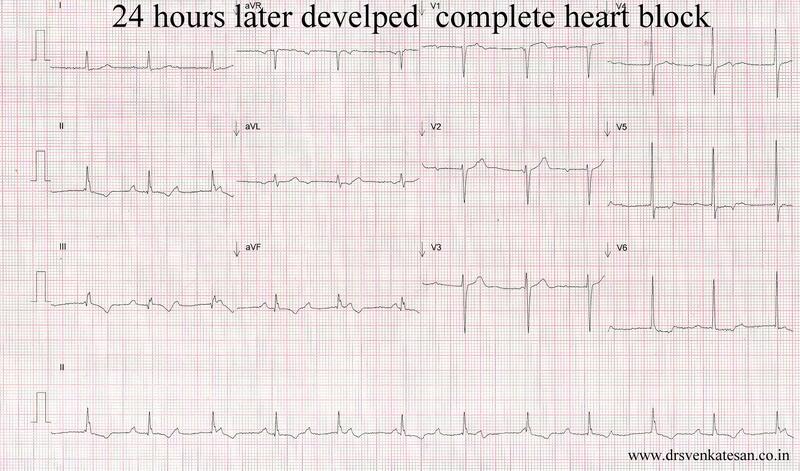 To our surprise , in the same evening his ECG showed a complete heart block with AV dissociation . Still the heart rate was good . The demand temporary pacemaker didn’t take over . On the third day , every conduction disturbance disappeared and patient was sent to the wards. He is being discharged in a stable condition with std drugs .there was a minimal wall motion defect in infero-posterior segments with an ejection fraction of 50 % . He is scheduled for coronary angiogram 2 weeks later. What is the pathology ? Pathologicallyit could be a small focal area of Infarct incidenataly invloving the AV node . (This is alss refered to as vital area Infarct” )It is hard to differentiate whether AV block is due to revrible ischemia or necrosis , simple tissue edema , high vagal tone . or combination of above .If the block recovers it can be concluded necrosis is not the dominant theme. 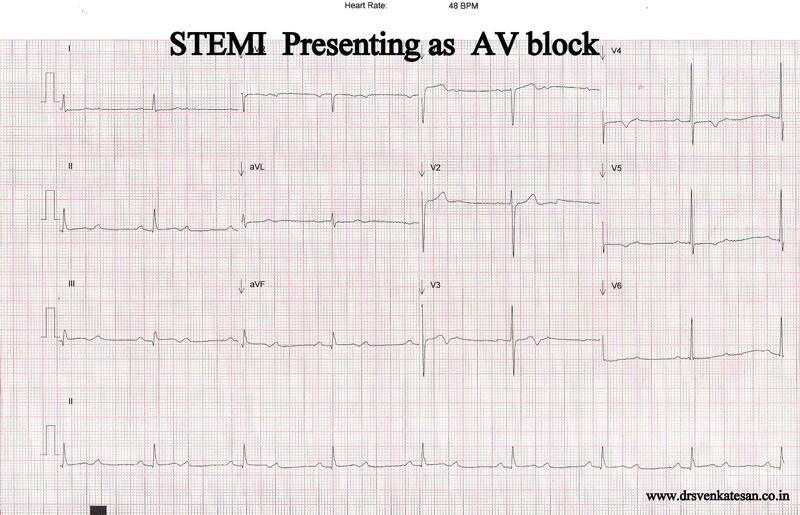 STEMI presenting primarily as heart block is less common . When such a presentation occurs extra caution is required. Many of these patients may not show a classical ST elevation and hence do not permit us to thrombolyse as per criteria. It is the individual physician’s discretion to do so ( or not to do ! ) . No body is going to fault. After all 5 % of thrombolyis world over is for benign early repolarisation syndromes. The above description is an example of complicated inferior MI . . . still managed effectively by conventional methods. Why inferior MI is considered Inferior ? Just wondering what cues you have used to determine that the initial 2:1 AV block ECG is 2nd degree type 2, and not second degree type 1? Thanks, and keep up your blogging! I am one of Clinical Cardiologist in Kabul , I really found your site very useful and really knowledgeable , I wanna share for more care some cardiological case with you that would be helpful either for upgrading knowledge and also for care of patient and residents . for this reason I need your address ?